Walk along the shoreline of the Deschutes River and study the vegetation growing on the rocks in the splash zone. There is a lot of it that is yellowish, greenish, stringy stuff that looks like some kind of algae. The fact is, much of what you think is plant life is actually midge eggs; zillions of billions of them. Some species of midges lay strings of eggs on anything that is wet at the edge of the water. This includes not only shoreline rocks, but boats, oar blades, and the waders of wading fishermen. These eggs hatch into midge larvae. Midge larvae are very simple, worm-like creatures. You can imagine how many there might be in square foot of river bed. In fact, in a square yard of river bottom, there can be thousands. That is a lot of food for trout and other fish. Midge larvae are found in all types of water, though those in stillwaters tend to be larger than those found in streams. They live on, or burrow into, the substrate and feed on algae or decaying plant and animal matter, though a few species prey on smaller insects. In streams the larvae are found in most water types, but bottoms where debris settles often have dense populations of midge larvae. Because midges have several generations per year, larvae are present in streams all year and are constantly found drifting in the currents. Even though they are small, the large numbers found in the "drift" offer trout a steady supply of food when other insects are not available. In heavily fished streams, trout often feed selectively on midge larvae, even when other insects are hatching. The flies below are effective midge larvae, and/or pupae patterns for moving water, and for still water. Fish them dead drift along the bottom of any river, or suspend them under a strike indicator any time of year on nearly any lake. Fine tippets often increase strikes. Midge larvae and pupae are often the most abundant and reliable food source for trout and bass during the colder months of the year, especially in natural lakes and farm ponds. Juvenile midges are the perfect early-spring and late fall food for game fishes. They are always available, and they don't consume much energy to hunt, and kill. Bead Head Midge flies can be retrieved very slowly near the bottom or suspended below a strike indicator in still waters. It doesn't get any easier than that. 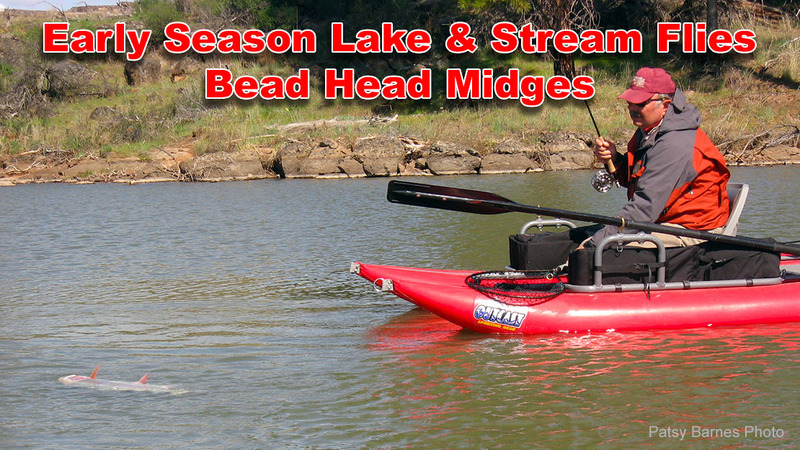 Suspend your Bead Head Chironomid (midge) under a Thingamabobber, and lean back in your float tube to enjoy the warm spring sun. Keep an eye on your Thingamabobber, and set the hook lightly when the fish pulls it under. Surprisingly large trout are caught this way. Midges can swim, but often suspend where the water temperature is right for them, or where their food collects, which isn't always at the bottom. For that reason, Bead Head Midge flies may be retrieved very slowly with a slow sinking or floating line, or fished at extreme depth with a deep sinking line. These flies can also be fished behind a larger Woolly Bugger.